Has CSR performance improved over time? What area of CSR is improving the most? Is the universe of companies for which ratings are available expanding beyond the large public corporations? How strong is the alignment between CSR performance and company CSR reporting on CSR? A dramatic increase in ratings sources beyond Wall Street-driven and research companies has expanded the field of companies for which ratings can be developed. For example, the number of companies and other entities studied by CSRHub has increased from 2,000 in 2008 to 18,000 in 2018. In 2008, the major sources of data were the analyst research houses which covered only large public companies. While this data produces rich consistent opinion matrices and remains a vital component of the CSRHub system, other crowd sources, not-for-profit groups, publications, and government regulators helped expand the covered universe to include smaller companies, not-for-profit organizations, and government entities. One of the reasons we developed CSRHub was because we felt there was a disconnect between reporting (what companies said about themselves) and performance (what companies actually do). We could not find a way to pierce the veil and determine performance directly. This is why we created a proxy based on the aggregate opinion of how a company is performing on ESG (environment, social, governance) issues, from a wide range of expert sources. Our scores build a feedback loop so that companies can see how their performance and reporting are perceived. We hope they will use this feedback to improve both the truth about their corporate social behavior and what they tell their stakeholders about themselves. We recently launched a new tool in partnership with Bloomberg that illustrates clearly that reporting and performance are still only loosely related. 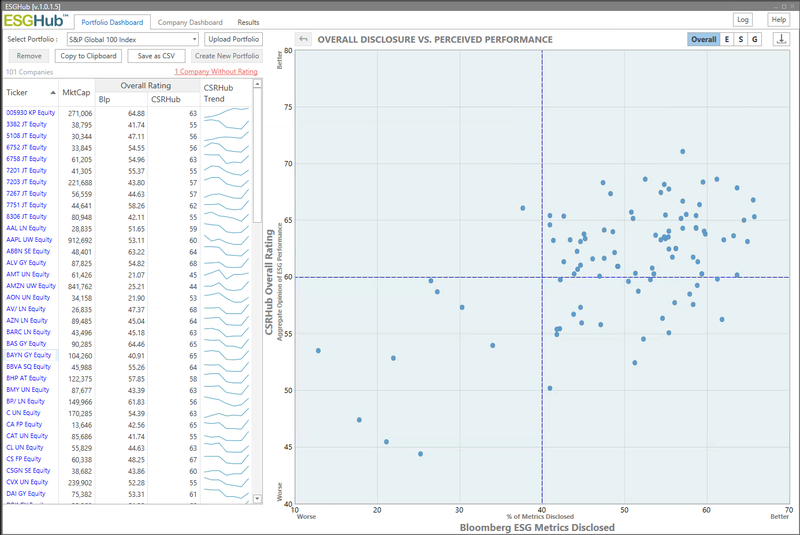 The chart below shows for the S&P 100 a measure of disclosure (the horizontal axis is the percent of Bloomberg’s 900 sustainability indicators that have been captured for each company) against a measure of perceived sustainability performance (CSRHub’s overall rating). The correlation between these measures is only 28%. This indicates that there must be other “explanatory variables” that drive how a company’s ESG performance is perceived, besides the extent of its sustainability disclosures. We don’t expect to see many major new analyst-driven sources of ESG data emerge. It is expensive and time-consuming to use human analysts to review and weigh a company’s sustainability performance. We’ve seen new data sets that are driven by news reports, tweets, or other bottoms up evidence. These sets are interesting, but we have not seen much correlation between them and the many other sources we review. There are many new sources of data coming from not-for-profit groups—especially those who have focused on supply chain issues. We also expect government-regulation-driven disclosures to expose more small and mid-size companies—especially in Europe and parts of Asia. Our big data-driven system seems to be working well and producing useful insights into the relative sustainability performance of thousands of companies. We plan to continue growing our coverage and tying the signals from our data to tools that can be used by companies, analysts, activists and researchers around the world. With the exception of the still-broad gap between disclosure and performance metrics, CSR has moved forward over the last ten years. CSRHub will continue to track the change in emphasis on core issues and incorporate new data sets as they emerge. What gets measured – and reported – is what gets implemented. We’ll keep working to help keep CSR moving forward for the next ten years. 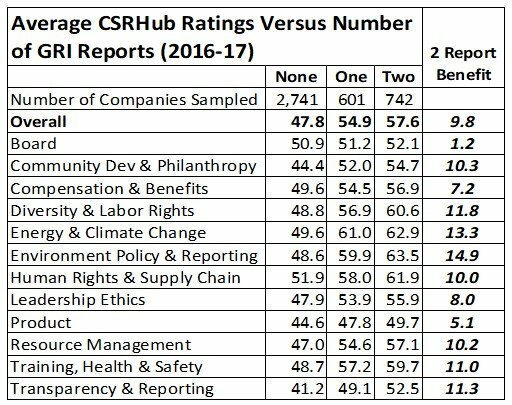 CSRHub’s ratings incorporate the input of virtually every major source of opinion about how companies treat environment, social, and governance (ESG) issues. Our patented methodology weights and combines these opinions in a way that makes them comparable both between companies and over time. 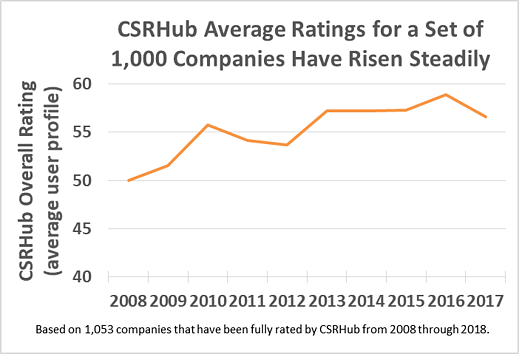 The chart below on Average CSRHub Ratings shows that since 2008, average ratings increased by almost 9 points to a peak in 2016. They fell somewhat over the last two years, but have still ended up by 6 points over ten years. Even from 2008 to 2010, through the worst of the Great Recession, ratings rose. The year-to-year changes are modest and gradual over time, suggesting there have been fundamental changes in business strategy for these companies during this period. We only provided sustainability ratings for around 2,000 companies in 2008—we could only find about 50 ESG data sources at that time. By now, we have gathered data on more than 140,000 companies from 550 sources—and offer ratings on more than 18,000. The growth in our ratings universe appears to have diminished the overall increase in ratings. The chart below shows that the average rating for all companies in our universe rose more slowly through 2014 than for the consistent set shown above. 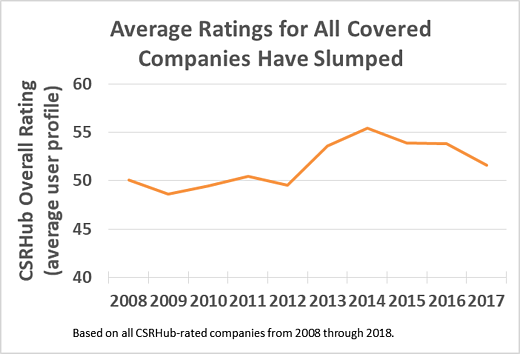 Then, as a flood of new companies began reporting information, the average rating for all companies has slowly dropped. Our overall ratings are based on twelve subcategory ratings that in turn feed four different category scores. We’d written previously about the fact that the emphasis between our four category scores seemed to shift over time. These shifts appear to be continuing. Governance rose sharply during the 2008-10—probably as a response to the 2008 financial crisis. Environment ratings surged in between 2012 and 2016, as companies responded to pressure on climate change and water issues. 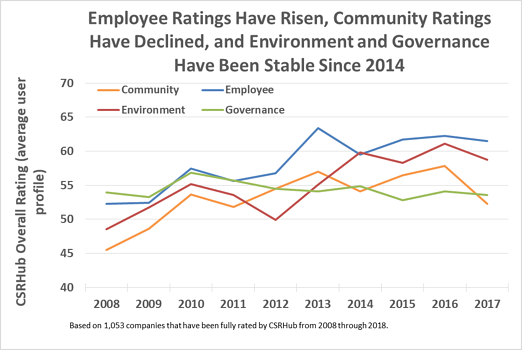 Employee issues have remained the most highly rated area since 2010 while Community ratings started as the lowest in 2008 and have stayed near the bottom. The idea that companies are more concerned about their employees than the community they live in is something we believe other ratings groups have not yet noticed. Look for part 2 in our series tomorrow, as we continue to explore CSR trends. CSRHub recently shared fresh insights into how to more effectively use ESG Data. Bloomberg sponsored the webinar and many of those attending were Bloomberg terminal users. CSRHub also invited members of its community to hear how to get more out of ESG Data. We have made the presentation slides used during the webinar available for you to download and use as a reference. You may request the webinar replay here. CSRHub recently launched an application called ESGHub on the Bloomberg terminal (APPS ESGH <GO>). 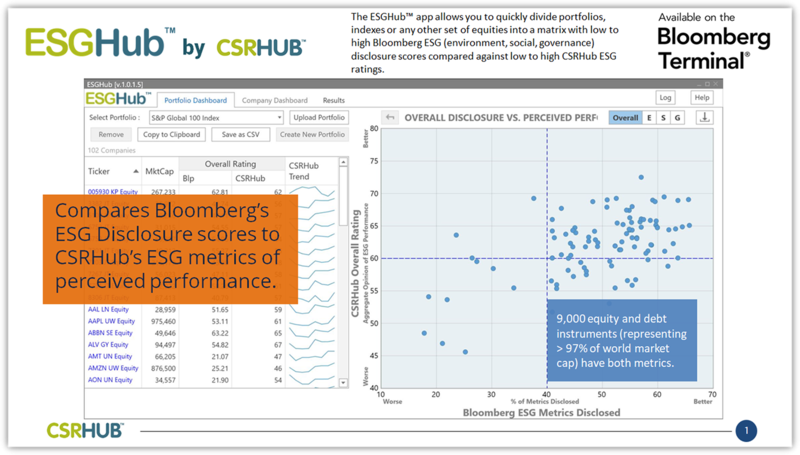 The app combines CSRHub data with Bloomberg’s ESG Metrics to create a new tool for examining portfolios and other large sets of investment instruments. The webinar attempted to show why this type of tool is needed and how the tool may help better integrate ESG data into the business processes of those who have a Bloomberg terminal. Bloomberg’s ESG Metrics is one of the largest sources of company self-reported ESG data. Bloomberg collects information on 900 indicators from about 10,000 companies. Other ESG sources use human analysts to generate company ESG ratings. We showed webinar attendees that company self-reported and analyst-generated ratings tend to be inconsistent and confusing. Patrick Drum, a senior portolio manager from Saturna Fund, shared his process for selecting instruments for his Sustainable Bond fund. He reviews a number of specific company-reported items and integrates input from several human analyst rating sources. His slides showed how hard it was to get consistent company-reported data. He also illustrated the range of views that human analysts had on the three instruments he wanted to evaluate. We then showed how CSRHub’s ESG data aggregation normalization process improves the correlation between both self-reported and human analyst data sets. We discussed the overall distribution of CSRHub’s consensus ESG ratings and showed CSRHub’s big data processing system can bring into focus the data for a particular company. The ESGHub app (a ten day free trial is available on the Bloomberg terminal at “APPS ESGH <GO>”) brings together Bloomberg and CSRHub data into an easier to understand and use format. Two thirds of those who attended indicated that they were encouraged now to make more use of ESG data. Q: Can ESGHub be used to screen green or gender bonds? A: Yes, if the issuer has shared data on its sustainability programs. ESGHub combines data from Bloomberg and CSRHub. It can only screen an issuer if there is data available from both of these sources. Q: How is CSRHub’s approach to generating a consensus score different from simply averaging a number of ESG ratings? A: CSRHub scores are a better estimate of consensus than any single or simple average. The webinar slides gave good examples of the focus and clarity that CSRHub’s Big Data system produces. There is also information on the CSRHub web site about its proprietary aggregation, mapping, and normalization process. Q: What strategies for engaging companies about ESG deficiencies could come from using ESGHub? A: A company that is low on disclosure (has a poor Bloomberg ESG Metrics score) but that is well-regarded for its sustainability performance (has a good CSRHub rating), should disclose more. One who has the opposite problem needs to improve its internal ESG programs. ESGHub users should be able to both offer useful advice to companies and illustrate their advice by making ESGHub charts that compare a company to its peers. Q: Would ESGHub cover companies that other ratings sources don’t? A: During the webinar, Patrick offered an example of three instruments he considered for his fund. It was encouraging to see that all three had CSRHub ratings. Because CSRHub aggregates so many different sources, it should generally have more ratings than any other ESG data source.